Some of these notes are extracted from the Word Heritage Committee Nomination Document, 2001. You can download this comprehensive document from this website. 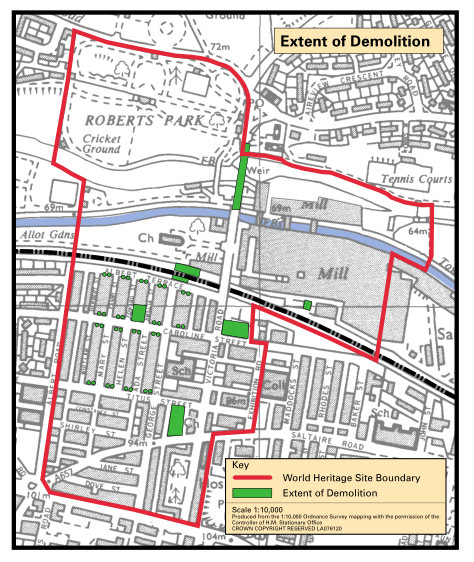 Image from the Word Heritage Committee Nomination Document, 2001. Less than 1% of the original buildings has been lost in the twentieth century, namely the Wash House, the Wesleyan Methodist Church, the Congregational Sunday School and Midland Railway Station. There has also been some loss of character of the housing by the insertion of a number of modern windows and doors, and the demolition of some rear boundary walls. Grant-aiding the restoration of original features and raising the house owners’ awareness of the significance of the village has now reversed this trend. The Wash House (located on Caroline Street) was opened in 1863 at the cost of £7,000. It comprised 24 baths (12 male and 12 female), a Turkish bath, six washing machines, a rubbing and boiling tub, wringing machine and hot air dryers. Washing could be taken, washed wrung and dried in an hour. Titus Salt was invited to submit a report to the Paris Great Exhibition in 1867, to be judged in a group of model towns, erected to enhance the welfare of the workers. The winning prize was 100,000 francs. Titus instructed Dr. Samuel Rhind, the Village doctor to file a report, but was not interested in the prize money. Titus Salt was awarded the French Legion of Honour, 1867. However, the facilities were unpopular and were eventually converted into housing. These also proved unpopular and were demolished in 1894. Years later, garages were built, but have subsequently been demolished and the site is now a garden area. The Wesleyan Methodist Church (backing on to Titus Street) was built in 1868 on land gifted by Salt in 1866. The building was demolished in 1970 due to its deteriorating condition and the design being impractical for modern use. 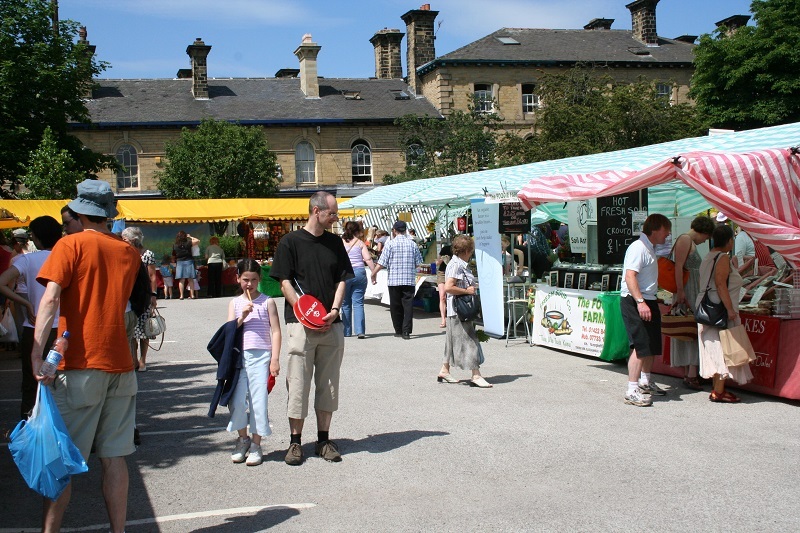 The site now has a new church, the Saltaire Methodist Church,which was built in 1971. It is stone faced and its original flat roof was replaced with a slate pitched roof, which was more in keeping with the surrounding roof style. The Congregational Sunday School (on the junction of Victoria Road and Caroline Street) was the last building for which Salt was responsible. Ir It was opened on the 29th April 1876 by Titus Salt's grandson, Harold (son of Titus Jr). In December of that year, Titus Salt died. The building was demolished in 1972. It was built on land originally intended for a hotel. Since 1994, the land has been used as a car park and toilet facilities for visitors which have been provided at a cost of £67,000. The Leeds and Bradford Railway (L&BR) (which was absored into by Midland Railway) was opened on 1 July 1846. A line existed between Shipley and Colne from 1851, and this line was extended to Saltaire and Shipley in 1856. This line closed on March 20, 1965 following the Beeching Axe, and the original station was demolished in 1970. The line was reopened on 9 April 1984.